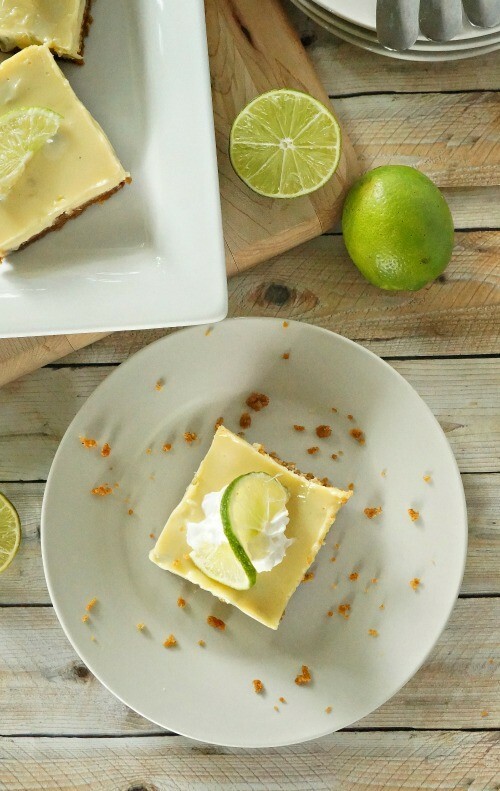 Love the delicious taste of key lime pie? These easy key lime pie bars are sweet, tangy and the perfect summer dessert, try this quick recipe! 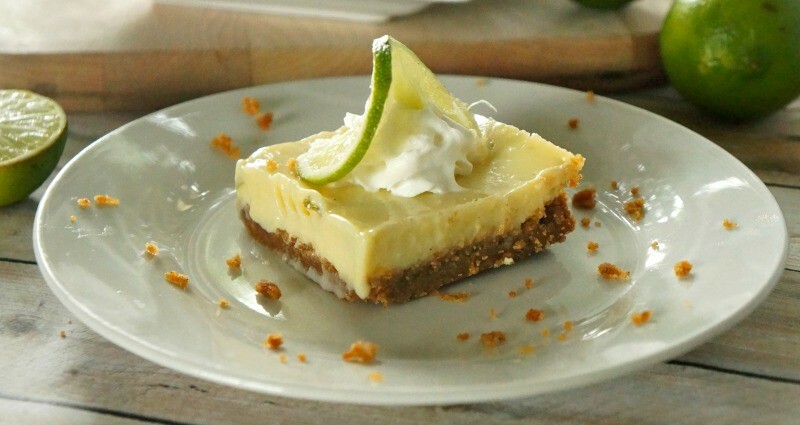 There’s nothing like a slice of good old classic key lime pie. 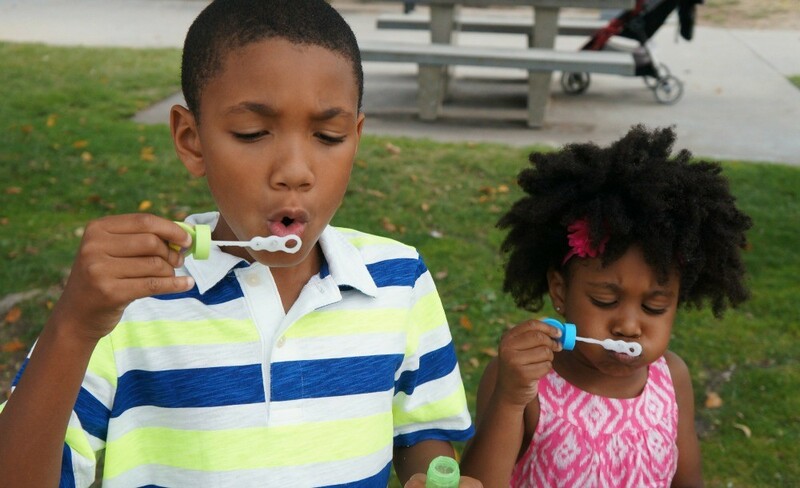 The sweet, tart flavor and creamy texture go so well together, such a delicious cool treat! I personally love the key lime pie at California Pizza Kitchen, I could eat it every day. We found the recipe and tried it at home and decided that we’d like to make bars, and see how it turns out. 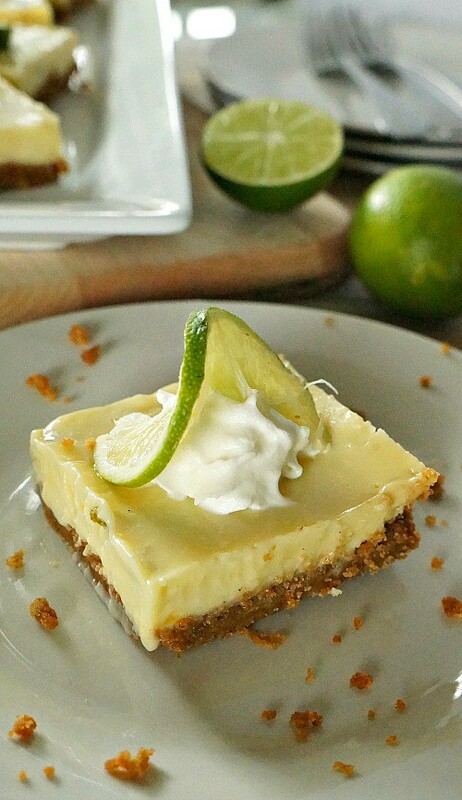 This easy key lime pie bars recipe uses a fresh lime juice, lime zest, and a homemade graham cracker crust – trust me, it’s a must try! There’s a reason that these are called easy key lime pie bars – just 8 ingredients and a couple of steps and you’re on your way to delicious sweet and tangy lime bliss! Preheat your oven to 350 degrees. 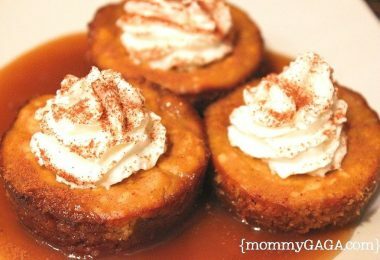 In a mixing bowl, combine graham cracker crumbs, cinnamon, and brown sugar, then add melted butter and mix well. Press graham cracker mixture evenly into the bottom of an 8 x 8 inch baking pan. Set aside. 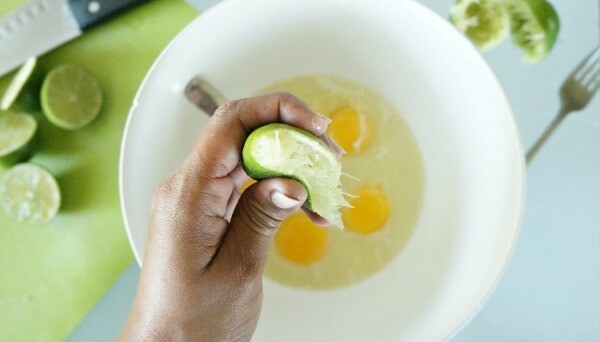 Thoroughly combine sweetened condensed milk, lime juice and egg yolks in a mixing bowl, fold in lime zest. 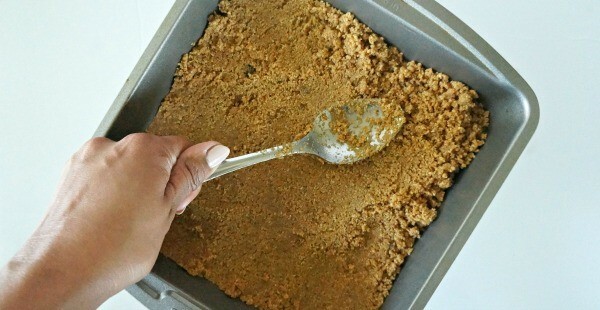 Pour mixture into graham cracker crust and bake at 350 degrees for 10 – 12 minutes. Zesting tip: If you have a zester, you’re better than me. I don’t have one, so I used my potato peeler and shaved off a bunch of flecks of the green skin on the outside of the limes I squeezed. I also tried a cheese grater and that hurt my knuckles! Allow this tasty batch of easy key lime pie bars to cool for at least 20 minutes, then cover and refrigerate for 1 -2 hours. Slice into 9 bars, add a little whipped cream, if you desire, and serve. Summer is here, finally! We love family time and the moments that matter, and I can tell you that these easy key lime pie bars will be made again very soon. Like maybe tonight, because they’re already gone. 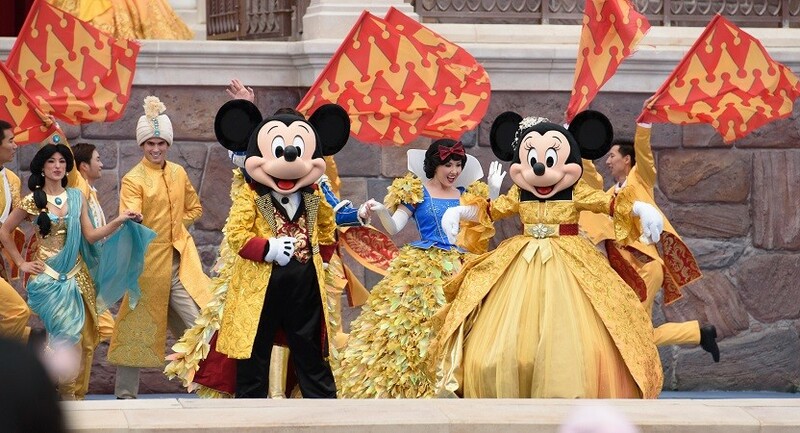 Enjoy the sunshine and treat yourself this summer! This recipe looks tasty! Key Lime is my absolute favorite! 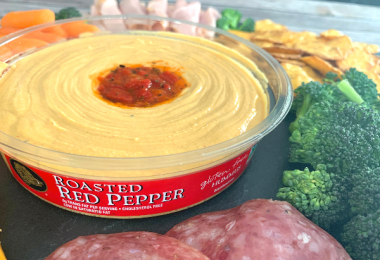 I love easy recipes and this one looks so good! Perfect for summer! 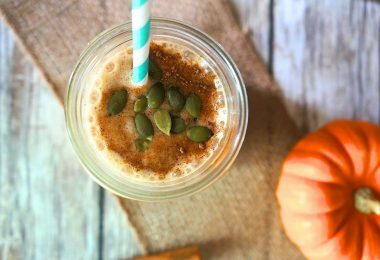 This looks pretty easy to make thanks to your detailed recipe instructions! Looks delicious! Wow, these bars look so delicious. What a great summer time dessert. What a really beautiful recipe! I like that they are in bars and we love Key Lime Pie! I will have to make this recipe for a summer treat!